A Badass Samurai Helmet Fit for Mickey Mouse. Yours for $2,600! Every spring in Japan, families with sons display miniature samurai armor. 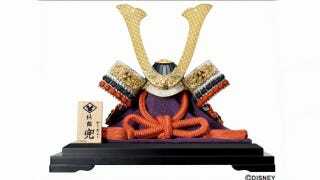 The armor, called yoroi (鎧), or samurai helmet, called "kabuto" (兜), are for Children's Day. Families want their sons to grow up strong and healthy. It's a Japanese tradition. Starting March 1, Disney, never one to shy from merchandising, is offering a "Disney Pure Silver Kabuto" for a mere ¥250,000 (US$2,680), putting it on the pricey end of the miniature samurai armor scale. As Japanese site IT Media notes, Mickey Mouse's silhoutte appears throughout the helmet's design. Nothing says Japanese tradition quite like Mickey Mouse.